Skyrocketing import bills have prompted the Planning Commission to propose a law that allows captive coal power companies to sell surplus coal from their mines. A three-member committee, chaired by Planning Commission member B K Chaturvedi, has prepared a draft to amend the Coal Mines (Nationalisation) Act, 1973, which does not allow such open sale. Power companies often fail to set up plants that use coal from coal blocks alloted to them—to generate electricity primarily for their own end use—within the stipulated one-year period. During this delay, the coal mined by the power companies remains unused, or surplus. The Act prohibits the companies from using this coal anywhere other than where permitted specifically. The proposed amendment comes as a relief to the companies, which, despite having hoards of coal in their mines, depend on imported coal. The Chaturvedi commission’s draft also proposes to free coal rejects and middlings from mines for sale. Byproducts of coal washing, rejects and middlings have low calorific value and are usually discarded. The 1973 Act prevents their sale in open market. However, rejects and middlings can be used in brick kilns and in some power plants after further washing. The panel says the draft makes good economic sense too, because on August 21 last year, coal import contributed 35 per cent to the current account deficit, resulting in the rupee’s weakening. However, the moot question is whether the UPA government, which is in its last leg, can muster support to amend the 1973 Act, more so when Parliament is likely to meet just once more before general elections are announced. The draft has been sent to various ministries and departments for comments, said Minister of State for Coal, Pratik Prakashbabu Patil in response to a query in the Rajya Sabha during the winter session of Parliament. “If the new policy is implemented, by 2017 India will have additional supply of at least 25 million tonnes,” says a coal ministry official, adding that revision of the Act has been pending since 2008 when the Cabinet expressed the need for a policy on surplus coal. Had the government acted earlier, it would have reigned in coal import, the official adds. Between 1993 and 2011, the government allocated 218 captive coal blocks with 50 billion tonnes of reserves to power companies. Of these, 47 were de-allocated because the companies failed to operationalise them within the stipulated time. Reasons ranged from delayed environmental clearance, slow development of coal blocks in remote areas and division of one coal block among many companies. These 218 coal blocks were expected to produce 100 million tonnes (mt) by the end of the last Five-Year Plan in March 2012. 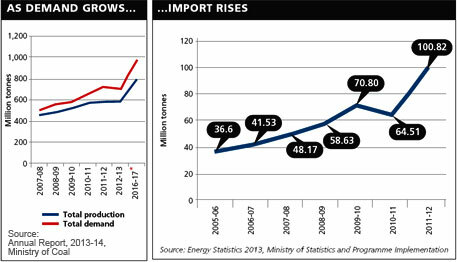 But production has stagnated between 30 mt in 2010-11 and 36 mt in 2011-12, leading to shortage. Dependence on imported coal is extremely high. In 2013-14, it is expected to touch 165 mt, crossing last year’s record volume of 135 mt, states the coal ministry’s in its annual report. But it is not just the government that wants to open the sale of surplus coal. The push comes from the industry too, the dispatch claims. Last year, Association of Power Producers of India (APPI), a body of 25 private companies, proposed coal banking system with the public sector Coal India Limited (CIL) acting as the custodian of surplus coal output. “This would have allowed captive coal companies, facing delay in the commissioning of their plants, give their coal to companies whose projects are already functional,” says APPL secretary Ashok Khurana. But CIL, the world’s biggest coal producer, refused to be part of the system calling it impractical. Coal ministry officials say coal banking may lead to hoarding and profiteering by captive power producers. The ministry’s keenness to formulate a policy on use of surplus coal is also because some captive coal power companies have committed blatant violations and excesses. Reliance Power Limited’s (RPL) is a case in point. The Comptroller and Auditor General’s report on Ultra Mega Power Plant (UMPP), tabled in Parliament in August last year, shows that the Anil Ambani-owned RPL was allowed to transfer surplus coal from one of its coal blocks in Singrauli district to RPL-owned Chitrangi UMPP project. This was done on the recommendations of Madhya Pradesh chief minister Shivraj Singh Chouhan. As a result, RPL earned Rs 29,300 crore as profits. “Permission for the use of excess coal by RPL from the three blocks—Moher and Moher-Amlohri extension and Chhatrasal (in Singrauli)—allocated for Sasan UMPP after its award not only vitiated the bidding process, but also resulted in undue benefit to RPL,” the CAG report states. Central Collieries Limited, a little-known Nagpur-based private coal mining concern, was found selling coal in the open market despite being allocated a block for captive use. The company was granted Takli Jena (south) block in Chandrapur district of Maharashtra in 1999 for its end-use plants. The company did not develop the plant for six years and sold coal from its mines in open market. The company’s mining lease was cancelled last year. Last year, Tata Power proposed to the coal ministry to allow companies to use coal from private mines to fire power plants elsewhere. It had sought government approval for using surplus coal from the Mandakini mine in Odisha for its Maithon thermal project in Jharkhand, which is facing coal shortage. Captive plant of the Mandakini mine is yet to come up. Since 2010, the coal ministry has been trying to frame a new policy that allows sale of rejects and middlings in the open market. On December 6 last year, an inter-ministerial group held its first meeting to formulate a policy for coal rejects. The meeting’s minutes, accessed by Down To Earth, reveal that differences between the ministry and CIL is causing difficulty in formulating a policy. India has commissioned six thermal plants that will use only washery-reject coal, and generate a total of 578 MW power. Four of these plants are ready for operation, but the ministry has not handed over letters of assurance to companies in the absence of a clear policy. Besides rejects and middlings, the four plants would need supplementary coal, mostly in the form of run-of-mine (ROM), which is raw coal. The blending ratio between ROM and rejects has been determined as 22:78. The plants need an estimated 0.55 mt of supplementary coal per year. But CIL has refused to supply it because there is no agreement or a clear policy framework to do so. The minutes show that the coal-reject generated by CIL-operated washeries are either used by its own captive power plants, or sold through e-auctions but not offered as assured supplies to other users. According to ministry officials, CIL should supply it to washery-reject coal-based power plants, considering the acute shortage of domestic coal. Given their relatively small size and investment, these plants cannot secure supplies from elsewhere, not even through imports. CIL, however, maintains that since rejects have the required calorific value for use in boilers, power plants should be so designed that they do not require raw coal as supplementary feedstock and operate exclusively with rejects. The power ministry countered CIL’s contention and showed that the company projects the gross calorific value (GCV) of its coal reject far more than what it actually is. CIL projects its coal rejects’ GCV to be 1,700 to 2,000 kilo cal per kg, but in fact it is as low as 1,000 to 1,200 kilo cal per kg. Considering this, the reject-based thermal plants’ requirement of blending rejects with ROM coal is justified, the power ministry states. Further, the quantity required to feed washery-reject coal-based thermal plants is small and will not exceed 0.55 mt a year. So CIL should consider supplying rejects at cost-plus basis that can help earn profits from sale, and offer their locked up coal on as-is-where-is basis, the power ministry states. The company should also provide projections of the total quantity of rejects and middlings that its coking and non-coking coal washeries generate, the ministry states. Even as the six washery-reject thermal plants wait for CIL and the power ministry to resolve their differences, private companies have been allowed to sell their mine rejects in the open market. 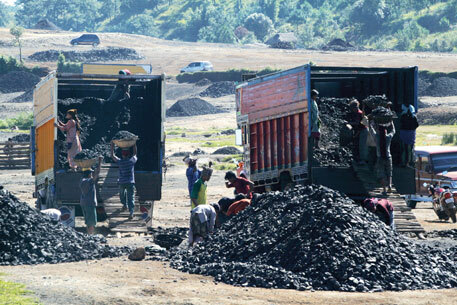 A letter issued by the coal ministry to the industry on May 16, 2012 has allowed surplus coal accumulating in dumps and mines to be sold because it poses fire and environmental risks. In the letter, the coal ministry allowed five major coal producers to sell their rejects in the open market. Between July 14, 2009 and April 27, 2012, the ministry permitted Tata Steel to sell 0.94 mt of middlings. Similarly, Jindal Steel and Power Limited was allowed to sell 0.91 mt middlings between July 28, 2009 and April 22, 2010. Integrated Coal Mining Limited, an RPG Group subsidiary, was permitted to sell 0.03 mt middling in 2009-10 and 2011-12. This apart, Kolkata-based Sharda Energy and Minerals Limited and Electrosteel Castings Limited were allowed to sell undisclosed quantities of middlings in 2011-12. This is baffling because it indicates a clear lack of uniform policy.